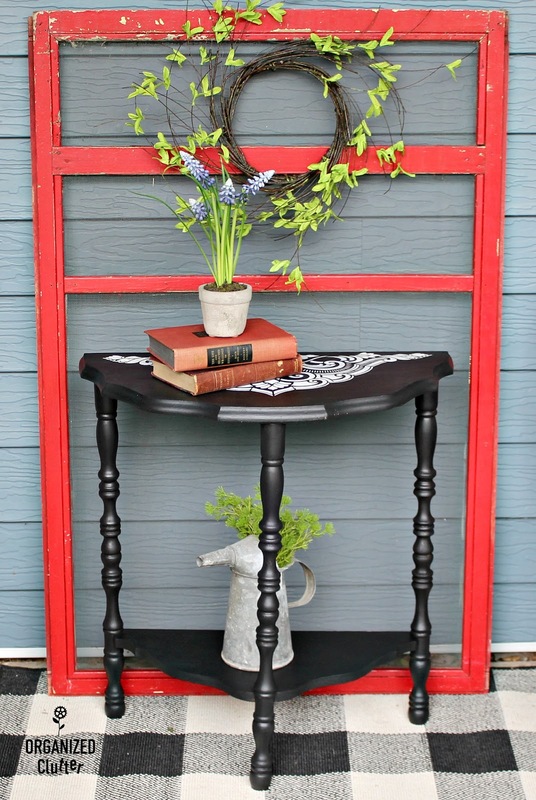 Do you remember this vintage thrift shop table from a recent junk finds blog post? 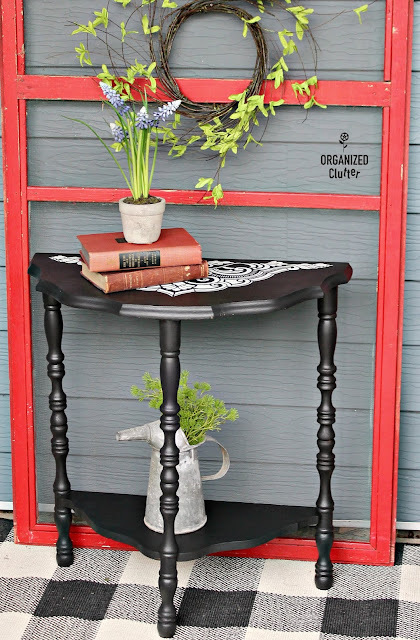 I am giving this little table a makeover today on my blog! 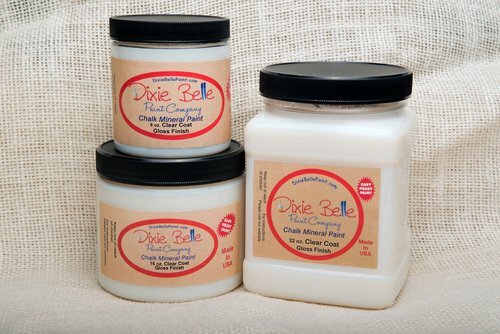 Have you ever tried Dixie Belle Paint? 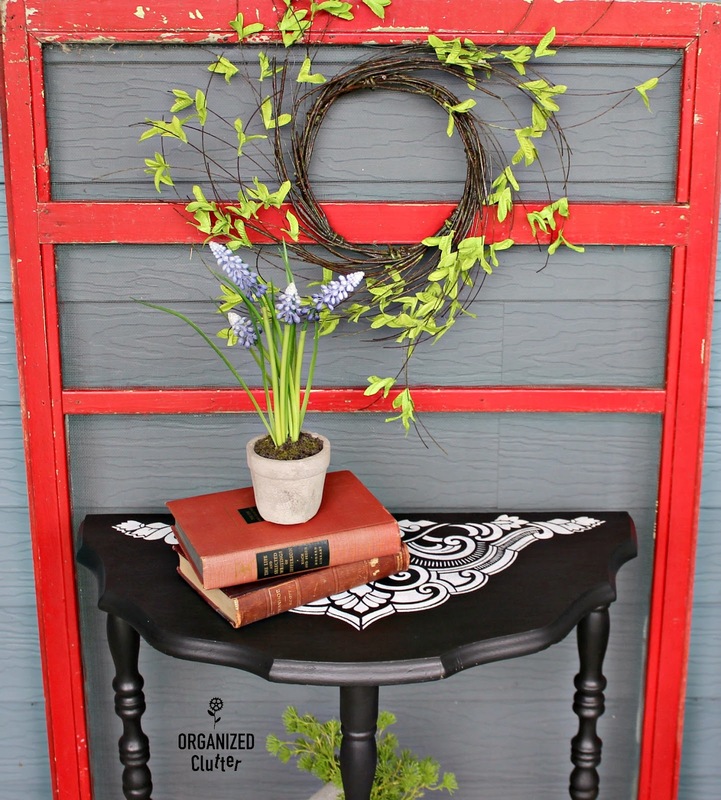 This is my very first project using Dixie Belle Paint. I chose a black shade called Caviar. 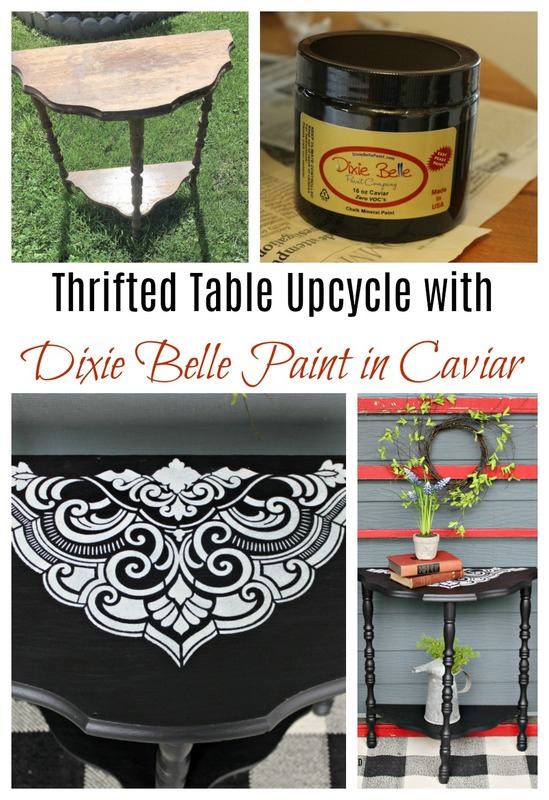 I became aware of Dixie Belle Paint from following the awesome blog of Larissa at Prodigal Pieces. It is her favorite paint, and she has a long portfolio of beautiful furniture projects on her blog. Check them out if you have time! I have done a lot of painting with different types of chalk paints, but I took the time to watch this short video on the Dixie Belle Paint website. I found it very useful. Dixie Belle Paint was very easy to brush on. I used a round type brush with natural bristles. (Remember to dampen your brush before use). I ended up using two coats. My table had a very uneven surface from water damage. I could have sanded it down for an ultra smooth finish, but I don't mind the vintage look of several coats of paint, and a few brush strokes. It gives the piece the appearance of age. Caviar is such a rich black tone. I laid one section of a FolkArt Stencil Four Piece Ornamental Damask stencil on the top. 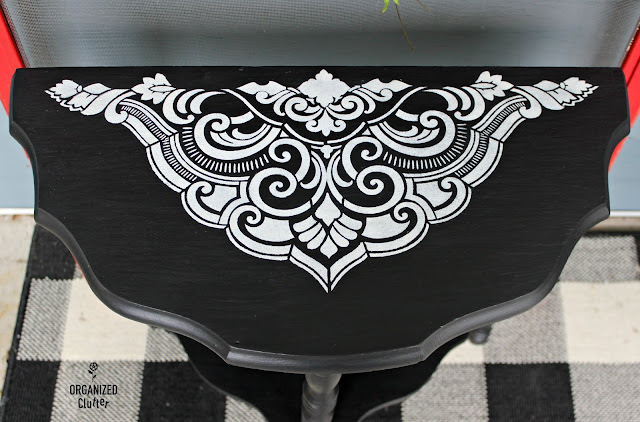 I think 1/2 of this stencil will work perfectly on this half (demilune) tabletop. I used Ceramcoat white craft paint to stencil design. I chose Dixie Belle Paint Company Satin Clear Coat to seal the chalk mineral paint. Again, I watched another short but informational video on the Dixie Belle site for with tips on the application of clear coat. If I have any further advice to offer on my experience with clear coat, I would say remember to dampen the brush and dip just the tips of the brush in the clear coat. You don't need very much. I applied two thin coats. The color is so rich, and the stencil is perfect for this table. A vision of rustic elegance! I will definitely be using Dixie Belle Paint again. I am thinking of a project in pink!!!!! *Dixie Belle Paint Company provided me with complimentary samples, but all opinions about these fabulous products are my own. My annual junk garden tour is right around the corner! Stay tuned! This turned out super pretty! I love it!